Media captionWould you eat green satsumas? Tesco has announced it will start selling green satsumas and clementines, as part of plans to cut food waste. The supermarket chain says the green oranges are "perfectly ripe" and will be as sweet as orange-coloured ones. Higher early season temperatures in Spain have slowed down the natural process by which the skin of the fruit turns orange. Other UK supermarkets have also branched out to sell less-than-perfect produce. In the past, retailers have been criticised for being too fussy. This has led to farmers throwing away large amounts of perfectly edible fruit and vegetables. Satsumas and clementines actually grow as green fruit to begin with, and the skin only turns to orange as summer wanes and the nights cool. However, in recent years, warmer temperatures during the early growing season for satsumas in September and October have continued to remain high into the autumn, thus delaying the natural process by which the fruit turns orange. Tesco launched the Perfectly Imperfect range in March 2016, which features apples, pears, potatoes, parsnips, cucumbers, courgettes, strawberries and frozen mixed berries. Tesco's aim is that no food safe for human consumption will go to waste from its UK outlets by the end of 2017. 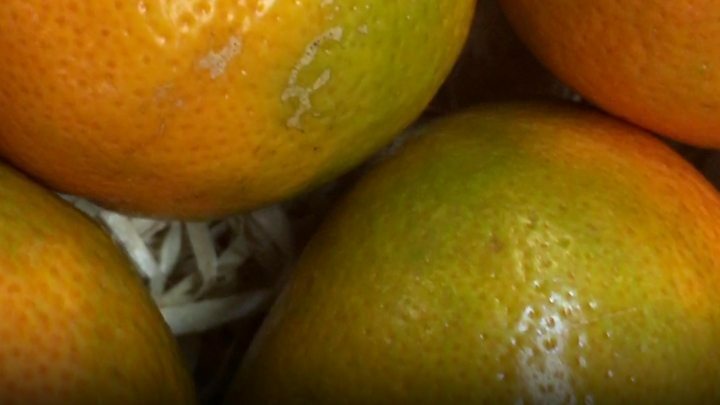 "Key to encouraging consumers to buy these is communicating - for example, prominently at the point of sale - that the satsumas are ripe and shoppers can expect the same taste they are used to, perhaps even by offering tasters," Kiti Soininen, Mintel's head of UK food and drink research, told the BBC. "From international examples, the success stories for initiatives to cut food waste by embracing 'ugly' fruit and vegetables have been the ones helping shoppers understand what to expect from the taste and quality of the food, and reassuring them that 'ugly' doesn't mean that the fruit and vegetables wouldn't still taste great."